Navigate your submarine to the reactor. Shoot flying saucers. For points. Shoot flying aliens. For points. Fight invaders in this brand-new TRS-80 game. Defeat the Jovian space fleet. Fill screen with test pattern. Not a game. Click on the Run button to start the BASIC interpreter. You will need to press ENTER twice to get the actual BASIC ready prompt. You can also try out a few other programs by selecting them in the table above. Note that the backslash (\) key is the TRS-80 clear key, needed to start Super Nova. Oh, and, sorry in advance, the backspace button won't leave the page because it is too useful for deleting characters. In fact, most short-cut keys won't work as the emulator needs to intercept most key presses. I haven't spent a great deal of time testing it although I've ran about a dozen different programs with no noticable problems. It was a hassle to get the emulator running on a selection of browsers. Some didn't support the <canvas> tag (IE and Opera) and the workaround version using CSS sprites required a horrific amount of fiddling. There's a bit of VBScript in here to allow IE to load binary data using AJAX. And, finally, the key codes generated varies a bit from browser to browser. I could have used JQuery or some other library but doing it by myself was educational. (Although I'll admit I haven't tried to cover a very wide range of browsers at all). At one point the emulator did function using Opera for the Wii and the PS3's internal browser--but far too slow to be usable. Owners of iPads or iPhone 3GS or better should be able to get the Cass? prompt going, again, a bit slowly. Shift-Zero toggles between upper case only/lower case input. Use underscore on your keyboard to get this function. Shift-right arrow switches to 32 character wide mode. A minimal page would look like the following. The performance graph is optional; drop the '.perf()' call if you don't want it. Multiple emulators can be created on a page. Use trsEmu.mknew() to create a new emulator and then give it its own .screen(). You will have to deal with the focus, perhaps via an onclick callback. Run binaries with the trsEmu.run() command. Just pass it a URL fragment and it will load the executable from your site using AJAX. It supports the .cmd, .hex (zmac output), .3bn (system tapes) and .bas formats. 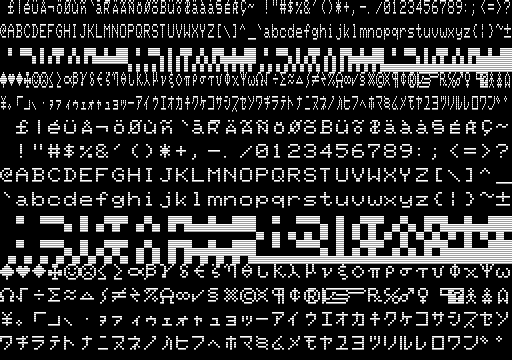 The .bas format is just an ASCII text version of a BASIC program. Version 1.3 added support for the .cas cassette tape format and binary basic programs. [count] delays for count frames. ~ is ignored but forces macro mode. other characters are typed literally to the keyboard. (Which, BTW, is done automatically when run is passed a string ending in .bas). Comments or questions to the email at the bottom of the page.